Latisse is the first and only FDA-approved prescription treatment to grow eyelashes longer, fuller and darker. Back in 2001, Allergan, a leader and pioneer in eye care, dermatology and medical aesthetics, developed a medicated eye drop used to treat ocular hypertension. In addition to successfully lowering eye pressure (the only treatable risk factor for glaucoma), many patients using this medication experienced a side effect—they began to grow longer, fuller and darker lashes. Allergan began its studies and this medication’s active ingredient and the resulting prescription treatment—Latisse—earned its FDA approval in December of 2008. 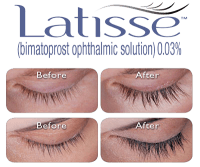 Latisse is a prescription product and should only be obtained by your doctor.